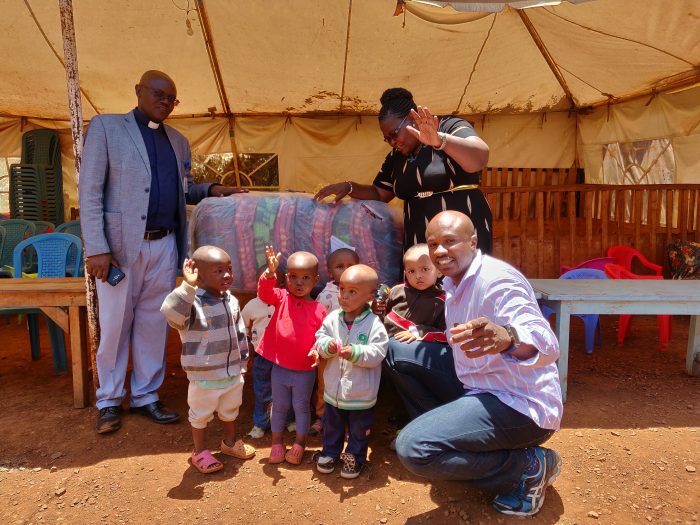 March 3, 2019: I have seen several photographs of this place before, but as I stood outside the gate of Makimei Children’s Home, it felt like Déjà vu. “Have I been here earlier? Do I know these kids? 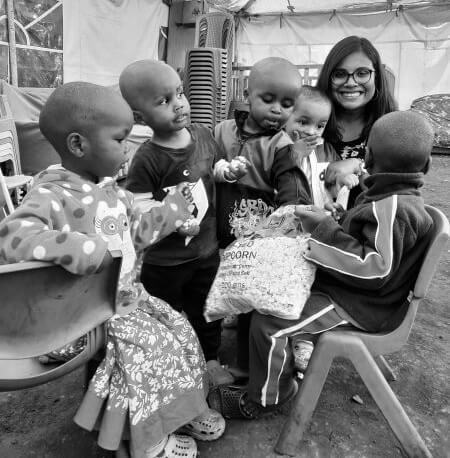 Will I be able to do anything good for them?” – I kept asking myself these questions again and again, and within a few minutes, I found myself surrounded by Emily and Lucas, jumping with joy and shouting out loud – “Muzungu Muzungu”*. I didn’t know what it meant, but I could feel that they were happy to see me and the other volunteers who were complete strangers for them! We stepped inside the home where the infants were still sleeping, and the smell of poop had filled the room! I am a person who’s very finicky about odour and things untidy, but somehow it didn’t bother me much. I stared at their faces as they slept in peace. 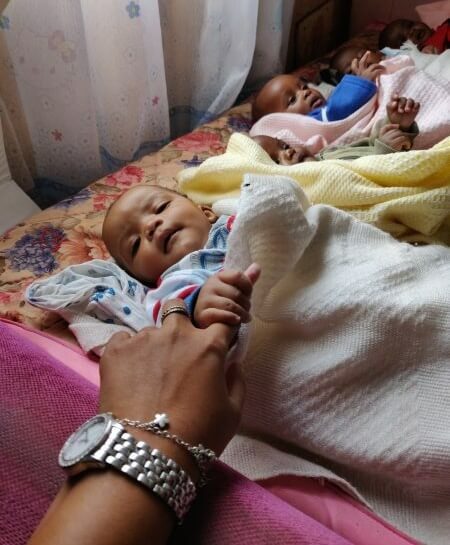 It was after about an hour or so, when the house mothers came in and woke them up, to change the diapers and feed them. They filled the bottles with powdered milk, stirred with lukewarm water and handed one bottle to each one of us. I started feeding Samuel, as he looked at me with a happy face! I don’t know why, but I had goosebumps – I felt as if he was waiting to be fed by me, as if he knows me since forever! Later, Mamma Margaret came with Baby Miguel (the youngest resident who was just 10 days old then!) and happiness knew no bounds! She said that she feels blessed for having volunteers visiting her home to spend time with the kids, to love them and to make life a little easy for them. *Muzungu means foreigner in Swahili. 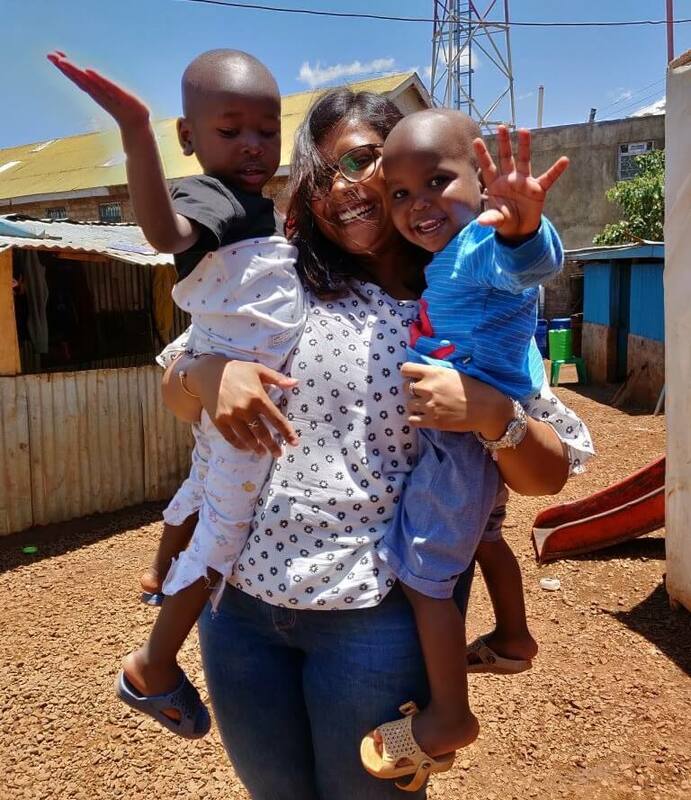 Ah well, this is just a bit from the pages of my diary and I can actually go on narrating every moment of those days that I’ve lived with the kids while volunteering at the Children’s Home in Kenya. 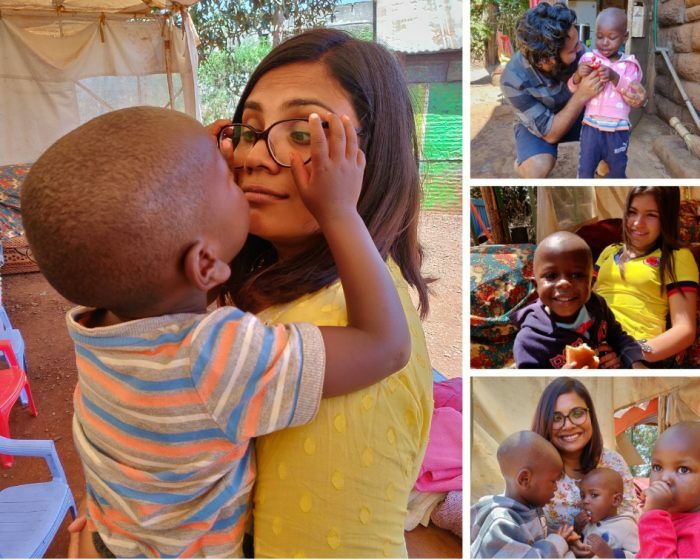 Living in a country like India where the problem of homelessness, poverty, illiteracy, etc, etc are still prevalent and so prominent, you might obviously think why I went all the way to Kenya to volunteer (and I feel it’s a valid question, ‘coz I’ve already been asked this by several people I know!). Well, that’s because I think I was destined to be there and to play a part in the lives of Lucas, Emily, Joshua, Uhuru, and the others. Philosophy aside, I did have some real reasons too. A couple of years back, I met some Spanish folks (who are now very good friends of mine) in Delhi, who had come down to work at a brick kiln in the outskirts of the city. When they shared their experiences, and how they were trying to do something in spite of the fact that there was barely any communication among them and the local dwellers, I was inspired. I was moved by their efforts to do something for humankind, beyond language barriers and other social chains. 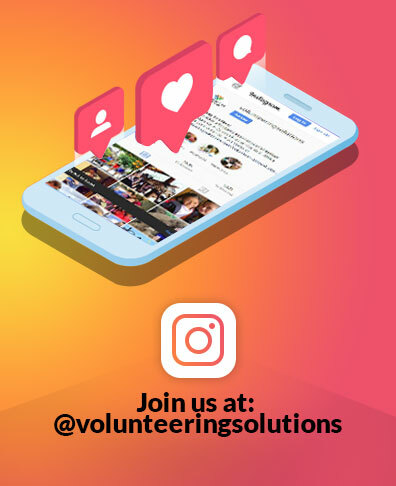 Later, luckily, I had the chance of getting associated with Volunteering Solutions and I got to know about hundreds of people who are stepping out of their country to lend a helping hand to people in some other part of the world. 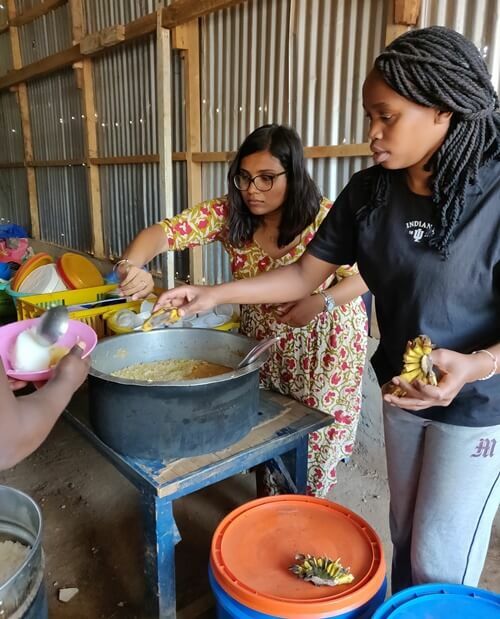 Volunteering abroad has a different charm – it’s a way to know another country more closely and to connect to the people who are so different from us, yet so similar! I guess I would have never got to learn so much about the Kenyan history, the social issues, the way of life, etc. if I would have just gone there for a holiday. It was a journey that broke me at times and helped me to challenge myself at different points. It was a journey that introduced me to some harsh realities and taught me the true meaning of selfless love. Mamma Margaret and the other house mothers have dedicated their lives for these kids who have been abandoned by their families. They’re trying to provide shelter, food, and basic education so that these children can grow up to be good human beings. All we can do as volunteers are to make this journey a little less painful for them. We usually left the accommodation after breakfast, at around 9′ O clock. Once we reached, our day began with feeding the infants. At times, we had to help them get water and fill the buckets for cooking and cleaning. Later, some of us helped the house mothers in cleaning the clothes and drying them, as well as folding previous day’s clothes and sorting them. Others got engaged in kitchen chores – peeling the potatoes, chopping the cabbages, etc. Around 12.30 PM, the lunch used to be served to all the kids and we had to feed them. The room gets filled with noise and chirps as they all shout and scream “Chakula, Chakula!” (which means ‘food’ in Swahili). Everyone wants to be fed, and since the number of kids was far more than the number of volunteers, we often had to feed 3 or 4 kids at the same point of time! Once the lunch scenes are over and the kids are recharged, it was time for another play session! At around 4’O clock, the kids who attend school returns back. Once they change and freshen up, food is served to them. We often helped them with their homework, but mostly they would be interested in seeing our cell phones. So I chose to show them informative videos (about planets, or animals) and they would be engaged in learning something new! There was a Mexican volunteer, who enthusiastically taught Spanish to the kids, and it was so adorable to watch him. 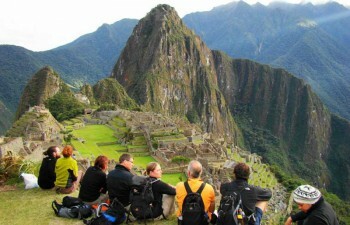 The day ends around 5′ O clock, when we all returned back to the accommodation together. Trust me when I say this, living with people from different parts of the world is absolutely incredible! There were people from Venezuela, Mexico, Columbia, Spain, India, and the United Kingdom – and every evening, we used to talk about lives back home and how things are in our country! Everyone shared their day’s experience, about the highs and lows, and what they plan to do the next day. As we had dinner together, it felt like I was a part of a family I never knew I had! there were days when someone would sing and play the guitar, or we would just take a stroll outside, stargazing! 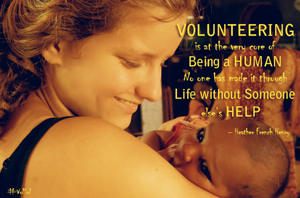 The volunteer house in Kenya is located in the outskirts of Nairobi, at a place called Lower Kabete. It’s a simple apartment, but the locality gave me enough opportunity to soak in the Kenyan vibes. 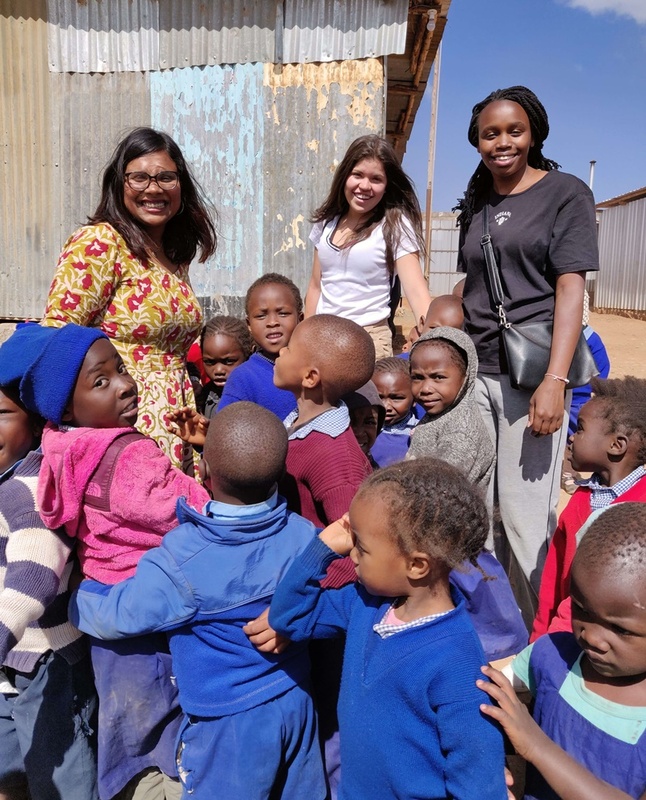 Although I was a part of the Childcare Program (as I had already mentioned), I was lucky enough to visit the school where the volunteers opting for Teaching Program in Kenya usually work. I have to admit that it turned out to be one of the craziest days I’ve ever lived. There were moments when I broke into tears, and thanked God for giving me a chance to be there. The moment we entered the school, we were surrounded by the little ones, jumping around us as if we are some celebrity in their area! Girls who were a little older came and touched my hair and clothes, and laughed among themselves. I could sense the happy vibes that filled the air with our presence. The school has another story associated with it. Even a few months back, it used to be at a rented place and Mamma Grace, the principal, had difficult times paying the money. Some of the volunteers from the USA actively raised funds to help her buy the land and now, she doesn’t have to worry about paying rents. Yet, there are several other issues that keep cropping up now and then! It’s a community school attended by the local kids, who can’t really afford to go to private schools. Apart from education, Mamma Grace also provides them with a morning snack and lunch. The school has 300 kids, of whom about 60 kids are abandoned and they live within the premises (they have their beds and are provided with dinner as well). That day, we sponsored their lunch (thanks to some generous and humble friends of mine who donated). We cooked rice and cabbage stew for the kids and the teachers and served them the meal. That thin line of a smile on their faces, as they put out their plates for food, shook me from within. For us, we generally never tend to pay so much attention to what we are eating, and a happy meal often means McDonald’s – but there, that moment, I realized what a happy meal in its simplest form can be like. It was an emotional moment as Mamma Grace wiped her tears behind me, and a friend hugged me tightly, as we both wept. While I spend the rest of the day listening to the stories of the school and the kids from Mamma and about her struggles, some of my fellow volunteers went to play football with the kids and some others were engaged with the little ones, telling them stories. We never realized how time passed, at it was already time for a wrap. It wasn’t just a volunteering journey for me, but a journey for which I’ll be grateful forever. It was a journey that helped me to believe in myself and to know the fact that even I have the power to make a difference in someone’s life. It was a journey that helped me to understand the goodness of humans and to appreciate the little things of life. It was a journey that made me realize that there are people whose problems are much bigger than that of mine, yet they aren’t cribbing. Instead, they are gladly rejoicing what they have! It was a journey which taught me the fact that it’s very easy to sit at home and discuss the problems, but way more difficult to come out and get hands dirty. It was a journey that helped me to grow a wider mindset, to think beyond the box, to live in the moment and to enjoy every bit that comes my way. I’m glad I chose to travel to a different continent, pushed myself to the extremes, tested my patience & perseverance, and got associated with something as beautiful as volunteering with children.